Booklet with notes and texts. My only hesitation in making this set Bargain of the Month lies in the fact I shall be following up this review with one of the King’s Consort’s companion set of the Complete Purcell Odes and Welcome Songs (Hyperion CDS44031/8), assuredly another strong contender for that title. I also have reviewed the excellent Helios reissue of Mr Henry Purcell’s Most Admirable Composures (CDH55303, James Bowman and the King’s Consort). Recorded and issued over a period of just over three years in the early 1990s, the individual CDs of the Anthems all received considerable acclaim on their initial release. 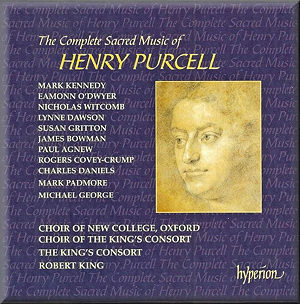 I bought some of the discs but never got round to the complete set because I had other good recordings of Purcell’s sacred music, though none quite to match The King’s Consort. In Purcell’s anniversary year it seemed appropriate to explore those recordings which I had missed; I suspect that these versions will now become my almost invariable versions of choice. Among rival versions of some of this music, the DG Archiv recording of Coronation Music for King James II, containing Purcell’s My heart is inditing and I was glad will certainly remain in my collection, since it also contains some excellent music by John Blow and some interesting pieces by William Child and William Turner (447 155-2,Westminster Abbey Choir and Orchestra/Simon Preston, not currently available but worth searching for). Preston’s time for My heart is inditing is a brisk 16:07 against King’s 16:58 on CD4. Exactly the opposite is the case with I was glad, where Preston’s 5:06 is noticeably slower than King’s 4:03 (CD7, track1 – not to be confused with the earlier setting on tr.4). Both make good cases for their interpretations of My heart but I have a definite preference for King’s account of I was glad. (I just wonder why these related works are on separate Hyperion CDs). Richard Marlow with the Choir of Trinity College, Cambridge (Conifer – no longer available) almost exactly splits the King and Preston timings at 4:28. This CD, too, remains of value, not merely because it disappeared with the demise of the Conifer label; like the Archiv, this DDD recording ought to find someone to reissue it in Purcell Year. I’d suggest that Brilliant Classics might license it, were it not for the fact that they already have an inexpensive 2-CD set which is worth exploring (99790, The Choir of Clare College, Cambridge/Timothy Brown on CD1, with Michael Chance and Miscellany in songs, music from Dioclesian, etc., on CD2). The sound on the Brilliant recording is perfectly acceptable; there are no notes, but the texts are provided. Both Cambridge choirs offer the music contained on CD7 of the Hyperion set, from the Book of Common Prayer, associated with the funeral of Queen Mary in 1695, very shortly before his own untimely demise. This music is generally acknowledged to rank among Purcell’s greatest achievements, so it seemed appropriate to use the three performances for comparative purposes. Clare’s opening Funeral March is dignified and impressive and leads into a sotto voce rendition of Man that is born of a woman, very effective in its understatement after the pomp of the march. In the midst of life, taken at an appropriately stately pace, is followed by the Canzona, Z860; like the opening march, this is both stately and impressive. Then follow Thou knowest, Lord and the final shortened version of the Funeral March. Taken on their own merits, these are moving, affective and effective performances. Marlow omits the march and begins the sequence with Man that is born of a woman. The notes suggest that he polishes this off in 1:25 but, in fact, he takes the piece at a slightly more sedate pace than Brown. In the midst of life also receives a dignified and thoughtful performance – again, the notes are in error in timing this at 2:25 (it’s closer to four minutes) – as does Thou knowest, Lord. Once again, these performances are very satisfying in their own right, though the omission of the march and canzona are to be regretted. Hyperion begin with the Drum Processional – the equivalent of Brilliant’s Funeral March – and the March, Z860, separately tracked (CD7, trs.10 & 11), and close the sequence with a repeat of the drums as a Drum Recessional (tr.17) King’s tempo in both instances is very similar to Brown’s on the Brilliant recording – slightly faster for the recessional than for the processional. The three performances are in close agreement over the right tempi for the vocal items, too. Yet, for all the virtues of the other recordings, King’s performances just have the edge. The drums in the march begin by being slightly understated and build up momentum and the four flatt trumpets make a powerful impression in the canzona, here performed as a postlude to the vocal items (tr.16). King’s attention to such small details as using flatt trumpets, instead of sackbuts, pays off. The notes point out that this was probably the first time in the 20th century that such a consort had been employed for this music. King scores, too, by offering two variants of Thou know’st Lord, Z85b and Z85c. The differences between these versions may be small but they are significant in giving King the lead. The Choir of the King’s Consort, too, have the edge over the two college choirs in the three sentences (trs.12-14), with excellent performances from Mark Kennedy (treble), Rogers Covey Crump and Charles Daniels (tenors) and Michael George (bass). Presumably this music would have been sung by the professional choristers of the Chapel Royal, so it is perfectly appropriate to use the Consort’s own professionals rather than New College Choir, whom King uses elsewhere. There is one other version of the music for Queen Mary’s funeral which pays even more attention to detail. The Sixteen, on an album entitled Love’s Goddess Sure was blind (Coro COR16024), offer the three Funeral Sentences, including the first version of Thou knowest, Lord, the Elegy on the Death of Queen Mary and, later on the CD, a complete performance of the music actually performed at the funeral – Purcell’s March, Thomas Morley’s settings of I am the Resurrection, I know that my Redeemer liveth, We brought nothing into the world, Man that is born of a woman and In the midst of life, followed by Purcell’s second setting of Thou knowest, Lord and Canzona, rounded off with Morley’s I heard a voice. To quote Bruce Wood’s Coro notes, what is usually performed, linking Purcell’s setting of Thou knowest, Lord, with the earlier Funeral Sentences is “a most uncomfortable mismatch in key, scoring and musical style, as well as liturgically incomplete!” Whilst I certainly cannot claim to be as ‘uncomfortable’ with King’s arrangement as that note implies, there is an undeniable stylistic advantage in what The Sixteen offer. The Brilliant/Clare set offers the Te Deum and Jubilate, as also does a mid-price 2-CD collection from the ‘other’ place: Christ Church Cathedral Choir and the English Concert under Simon Preston (459 487-2). King’s 14:14 compares closely with Preston’s 14:08 in the Te Deum – surely, this is just about the right tempo for this piece; the faster tempo on the Clare recording (11:16) may seem more exciting in this music of praise but ultimately it has to be King or Preston here, with little to choose between them, especially as King employs another Oxford choir, from New College. The Clare recording of Jubilate also seems a little too fast at 7:12; here Preston takes 8:18 and King is slightly more expansive at 8:43 – again, I enjoyed both. If there is one other Purcell recording in my collection which I regard as inviolable alongside the Hyperion, it is this 1981 DG set. Though ADD, the recording is still very competitive. I merely quibble with the statement on one retailer’s website that much of the music on this set is otherwise not available – it is, on Hyperion. To take a few other items from the Christ Church/Preston recording, My heart is inditing, at 15:18, is brisker than Preston’s own later recording referred to above and much faster than King’s 16:58; if I marginally prefer King to Preston’s second thoughts, I much prefer him to the earlier Preston recording. King’s version of O sing unto the Lord, which opens CD1, is also broader than and slightly preferable to Preston’s account but in They that go down to the sea (CD8) and Praise the Lord, O Jerusalem (CD1), honours are about even. The strongest competition for the Hyperion recordings comes from New College Choir who, themselves, of course, are among the participants in the Hyperion venture. Under the ægis of Edward Higginbottom they have recorded five of Purcell’s verse anthems and a Voluntary in d minor for the CRD label (CRD3504). The anthems all receive excellent performances, which I thoroughly recommended in my February, 2009, Download Roundup along with several other New College recordings for this label. The CRD performance of My heart is inditing is instructive: heard on its own, this interpretation makes excellent sense, with no feeling of dragging, yet Higginbottom takes 18:42 against King’s 16:58, Preston’s Christ Church version at 15:18 and his Westminster Abbey version at 16:07. It’s only by comparison with King and Preston, however, that I felt that Higginbottom could do with a little more lift. In O sing unto the Lord Higginbottom is actually marginally faster than King (CD1) and only slightly slower in Praise the Lord, O Jerusalem (also CD1) – there’s very little to choose between the two accounts of these works. My beloved spake is a highlight of both the Higginbottom and King programmes (Hyperion CD1 yet again); once more, close comparison awards the palm by a small margin to the Hyperion. In either version, it’s a beautiful anthem, fully worthy of comparison with any other composer’s setting of music from the Song of Songs – even Monteverdi’s and Palestrina’s. My beloved spake also features on the Brilliant/Clare recording – here again I felt that the performance was just a little too fast to bring out all the beauty of the music, though the concluding Alleluia goes with quite a dash (9:35 against Higginbottom’s 10:49 and King’s 11:23, both of which I find much more to the point). The centre point of the CRD album is provided by the Voluntary in d minor, a very welcome addition to a CD of verse anthems and excellently played by Paul Plummer. Immediately preceding it comes Rejoice in the Lord alway, perhaps Purcell’s best-known work, since it very early acquired the nickname ‘Bell’ Anthem from the introductory instrumental passage. It’s hard to imagine a better performance than Higginbottom’s, but King runs it very close indeed – perhaps even excels it – with a slightly earlier incarnation of New College choir, very ably abetted by James Bowman, Charles Daniels and Michael George (CD5, tr.12). King’s slightly faster tempo does full justice to the work and the choristers respond to him as well as they do to their own regular director. I must emphasise, in the case of the Christ Church/Preston and New College/Higginbottom recordings that it is only very close comparison that reveals these differences – heard on their own both recordings are thoroughly enjoyable. Even the Clare recordings are well worth hearing in their own right – some listeners may prefer the slightly faster tempi. I listened to the CRD in very adequate mp3 sound, courtesy of eMusic, not quite a match for the Hyperion, though the parent CD may well be. A few of the devotional songs also feature on the Helios reissue of the Most Admirable Composures to which I referred at the head of the review, King and Hyperion competing with themselves three years before commencing the complete series. James Bowman sings We sing to him whose wisdom form’d the ear as the opening item on that CD and Susan Gritton performs it on CD5 of the set. How long great God? (Helios, tr.3) is also sung on CD5 (Noel Witcomb, treble, tr.3) and Bowman rounds off the Helios reissue with The Evening Hymn, also sung by Eamonn O’Dwyer, treble, on CD11, tr.9. I’ll save detailed comparisons for my forthcoming review of the Bowman reissue; suffice it to say that all three are excellently performed on the complete set and no less splendidly by Bowman. I have, of course, concentrated on those works where I could make direct comparisons. Space doesn’t permit detailed analysis of the other contents; I merely point out that I found the performances throughout of the highest quality, the recording equally excellent and the detailed notes in the large booklet scholarly, informative and readable. The individual CDs are in cardboard slip-cases, housed in a hinged box. The documentation is very thorough, except that I had to work out the timings of the CDs myself. At the time of writing, only Volumes 1 (CDA66585), 2 (CDA66609) and 11 (CDA66716) remain available separately from Hyperion, though one dealer is still offering Volumes 3 (CDA66623), 5 (CDA66656), 6 (CDA66663), 9 (CDA66693) and 10 (CDA66707). Some individual volumes are also available from iTunes at £7.99 in 256k mp3 sound. I can almost guarantee, however, that the purchase of any one CD from the set will tempt you to buy more – better to buy the complete set for less than the cost of 11 downloads and for about half the total price of the eleven separate CDs, even if you can still locate them individually. The contents of each CD are very varied – take volume 5, for example, on which verse anthems and full anthems are separated from each other by smaller-scale devotional songs, the whole disc rounded off by the famous ‘Bell’ Anthem. You may not wish to listen to all 11 CDs straight through, though that is more or less what I did, with no sense of fatigue. Like Bach’s cantatas, there are no real duds here and, though I sometimes complain that the ‘Building a Library’ style of comparison exaggerates differences between performances which sound fine in their own contexts, detailed comparison with the other recordings which I’ve mentioned have almost always been in favour of these Hyperion versions. If you really can’t bring yourself to the purchase of 11 CDs, go for the first Hyperion CD or the CRD recording. If you can run to two, buy either the 2-CD Preston set or the CRD plus Hyperion volume 2 or 5.